If your pet's breath smells bad, take immediate action because it is one of the surest signals that your companion is headed for life-threatening health problems, a leading veterinary oral care group cautions, and a new report about heart ailments and dogs gives much credence to the warning. Bad breath is caused by gum disease, which three of four dogs will develop by middle age. If left untreated, it will lead to bacteria invading the bloodstream and possibly damaging a pet's heart, liver and kidneys, according to the Veterinary Oral Health Council. 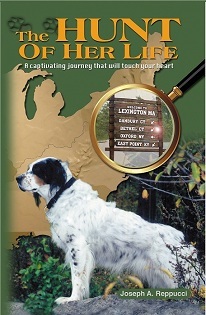 THE HUNT OF HER LIFE, is a nonfiction book about Samantha, an unwanted rescue dog who the author adopts at age 2. This beautifully designed full-color deluxe book, by longtime newspaper journalist Joseph A. Reppucci, contains more than 60 vibrant color photos of dogs to help illustrate the compelling and uplifting story of Samantha - a pretty tricolor bird dog who uses her warm personality to win people over and build a new family after being put up for adoption by a hunter because she is gun-shy and afraid to hunt. Learn how she uses her special bonding abilities with people to help her eventually make a transition from the hunting fields to family life. While reading the The Hunt of Her Life, you will travel with Samantha and the author along a trail filled with surprising twists, sudden turns, mystery and even what some call a miracle. And when the journey is finished, you may never look at people and their pets, motherhood - and perhaps even God - in the same way. The Hunt of Her Life is must reading. It will take you on a captivating journey - a trip like no other - that will touch your heart. And a Purdue University professor's findings of a definitive link between gum disease and heart problems in dogs underscores the magnitude of the problem. “We knew from previously published research that there was growing evidence of a link between gum disease and heart disease, diabetes, birth defects and low birth weight among humans," Larry Glickman, a professor of epidemiology who conducted the study, states in a media release. "So we thought it was time to assess whether such a link existed in dogs. The research is important because gum disease occurs in up to 75 percent of all dogs by middle age." For the study, which was published in the Journal of American Veterinary Medical Association, Dr. Glickman examined records of 59,296 dogs with gum disease and matched them to those of a similar number of dogs without gum problems. He followed the dogs to see which ones developed heart diseases and the type. He did statistical tests which showed the incidence of heart disease increases with the severity of the gum disease. Dr. Glickman says isolating the specific bacteria in the mouth that causes the inflammation of gums can lead to better treatment and prevention. "Knowing the mechanism is important, because it'll allow us to develop preventive drugs and then examine their effectiveness," Dr. Glickman said. "We can also get pet food companies to develop foods that will prevent gum disease in dogs and cats." Preventive care is the best way to stop pets from developing periodontal disease and that starts with the brushing of teeth, Johnathon Dodd, a clinical associate professor at the Texas A&M College of Veterinary Medicine & Biomedical Sciences, states in a media release. "Ideally, you should brush your pet’s teeth daily,” he said. Pet toothbrushes and toothpaste, which usually coming in different flavors, can be purchased at veterinary offices and pet retail stores. Pets also should have their teeth annually cleaned and examined by a professional, Dr. Dodd said. “Most veterinary clinics should offer dental cleaning services, but if they do not they can refer you to someone who does,” he said. Certain dog treats also promote good dental help, Dr. Dodd said. “The right kind of treat should crumble, be easily crushed, and contain chlorhexadine or a hydrogen peroxide-type additive that can help with the bacteria count in the animal’s mouth." According to the Veterinary Oral Health Council, periodontal disease - an infection resulting from the buildup of dental plaque and tartar on the surfaces of the teeth around the gums - is the most common ailment that occurs in pets. The bacteria in plaque irritates the gum tissue, which can lead to infection in the bone surrounding the teeth. The condition usually causes bad breath, painful irritated gums that can lead to bleeding and loss of appetite, and the loss of teeth. The bacteria will eventually get into the bloodstream and can damage internal organs.